We are living in an Internet age and we are moving at a very fast pace. In order to ensure that we continue moving at that fast pace, a lot of things have to run and perform operations to make that happen. Unfortunately, we may run into some unfortunate errors sometimes, like this “Confirm Form Resubmission” error which many users of Google Chrome are facing. This is a very serious kind of error which occurs when we are submitting some kind of data through a form and the function the form is using to submit the data is POST. When you are purchasing anything online and after entering your credit card info suddenly your browser shows as “Confirm Form Resubmission”. Filling out a contact us form on a website. Filling out your pieces of information on different kinds of website forms which involves some kind of editing on the database, then you might also see this error. Mostly happens when you submit a form with the method “POST” which then also posts back the same page and when you press enter again from the URL bar, it shows “Confirm Form Resubmission Error”. Sometime even due to some cache errors you might end up adding the thing you want to buy two times in your cart. This error also occurs at this time. What Is Confirm Form Resubmission? What Does Confirm Form Resubmission Mean? How To Avoid Confirm Form Resubmission? Confirm Form Resubmission is an error which primarily is an error which occurs in the popular web browser Chrome while sending a POST request when submitting a form or pretty much just entering some kind of data to be transferred to a database. Google says that they introduced this feature in their web browser Chrome which automatically makes users avoid duplicating a POST request while entering data on a form on a website. What it means is it is an error or more correctly is a feature from Google Chrome which appears or prevents users from accidentally reproducing POST actions on data submit forms. A simple example of this would be entering your email address twice while entering it on a website or simply buying stuff twice mistakenly while purchasing something online. Confirm Form Resubmission also appears as ERR_CACHE_MISS sometimes and it can be pretty annoying. Get into your code and look for this specific piece of code, which is a POST function and this is the main cause of the problem. Then replace that line of code with this GET function and you will see that you are no more getting this error from Google Chrome. There is also another method which can be used to avoid this error from presenting itself again and again. You have to add these two lines of code at the beginning of your code. Find the Chrome Browser Icon. Right, Click on the shortcut. In the Target Field, add “-disable-prompt-on-repost ” and then save the properties. It should stop after that and for any help refer to the image below. There can be a lot of harmful extensions present on your browser which might be collecting your data or messing with your data, while you are browsing. Goto your extension manager and remove all the extension which you don’t use anymore or which may look suspicious. These suspicious extensions can contain malware which in turn might be spying on your network and all your online activities. So it is better to look at all the ones available and remove the unknown and suspicious ones which you have forgot installing and you use no more. 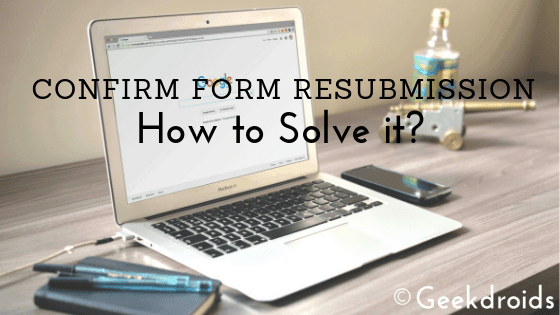 What Does Confirm Form Resubmission Mean and How to avoid it? Yash is a college student, who loves to blog and help people through this platform.